Why Aren't We All Developers By Now? exterior of bank, February 2012. Photo by Eric Allix Rogers. The Stony Island Arts Bank began as a last ditch attempt to save a stately but neglected city building from the wrecking ball. This quickly snowballed into a complete redevelopment plan, requiring architectural programming, planning, and design, project financing, placement on the National Register of Historic Places along with Historic Tax Credits, and getting a city ordinance passed for the sale of the building for $1. The Arts Bank tells a poignant story of institutional neglect and racism in many ways. Housing four different failed/corrupt banks since it's completion in 1923, the building was unused as a bank for the majority of its life. 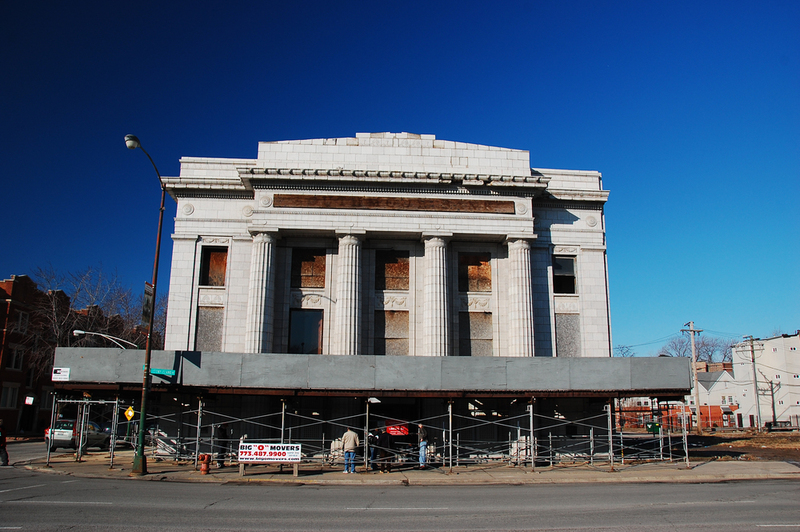 Vacant since 1980, the building's structure held up remarkably well, despite it's neglect and abuse, while historic banks on the North side, including a younger bank designed by the same architect, were nominated for City Landmark status with public assistance for improvements. As part of the design strategy, it was essential to us that the National Registration reflect a form of preservation that stabilized and kept intact the interior elements that could tell this story of neglect. The primary programs of the building are a first floor event space in the banking lobby, with a temporary bar and exhibition space. The second floor houses reading rooms and a permanent collection of the Johnson Library - a collection of the editorial libraries of Ebony & Jet magazines, as well as John Johnson's personal library. The third floor houses various offices, studios, and other collection spaces/reading rooms. The building was scheduled to be demolished in February 2012. By Fall of 2012 we had introduced the ordinance for the sale of the building to City Council, and by Summer of 2013 we had ownership of the building and both building permits and construction financing in place. Construction followed, adapting to significant design changes along the way, and the building eventually opened to the public in October 2015. I performed the primary project development, design, and management through August 2014 as an independent consultant to Stony Group LLC, the owner of the property.